← Want To Learn How To Make Italian Sausage? 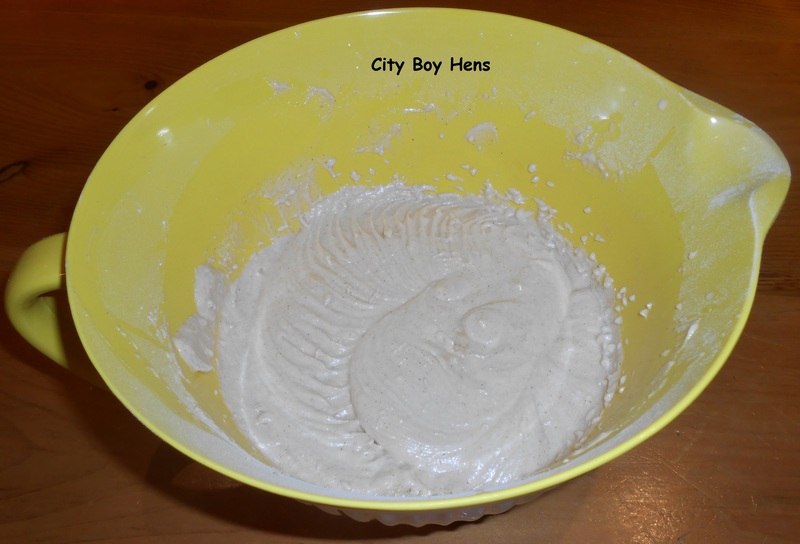 We like to eat a lot of apples at City Boy Hens. So much so, that I buy them by the bushel. On their own, apples make a great snack, but combined in a cake….they are excellent. 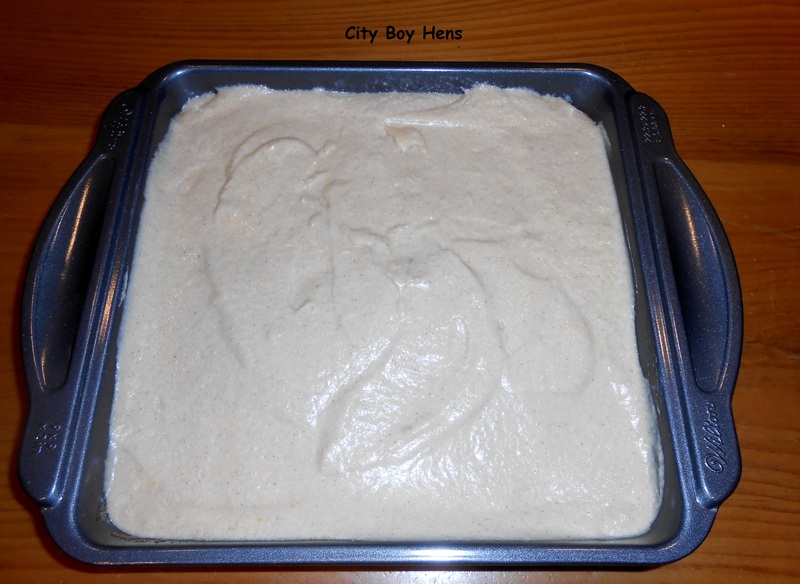 This cake is very easy to make and is a family favorite. It originates from memories of my childhood when it was baked by my Mom on Sunday afternoons in Winter. I guess I’ve managed to “pass the torch” because my kids love this cake as well and it always makes its first appearance of the year on Thanksgiving weekend. Up here in Canada, we already celebrated Thanksgiving back in early October and now I have the opportunity to share this recipe with my neighbors who are “south of the border”. I hope you give it a try. Pour melted butter into a 10-inch cake pan. Make sure to cover the edges of the pan. Add sliced apples and set aside. 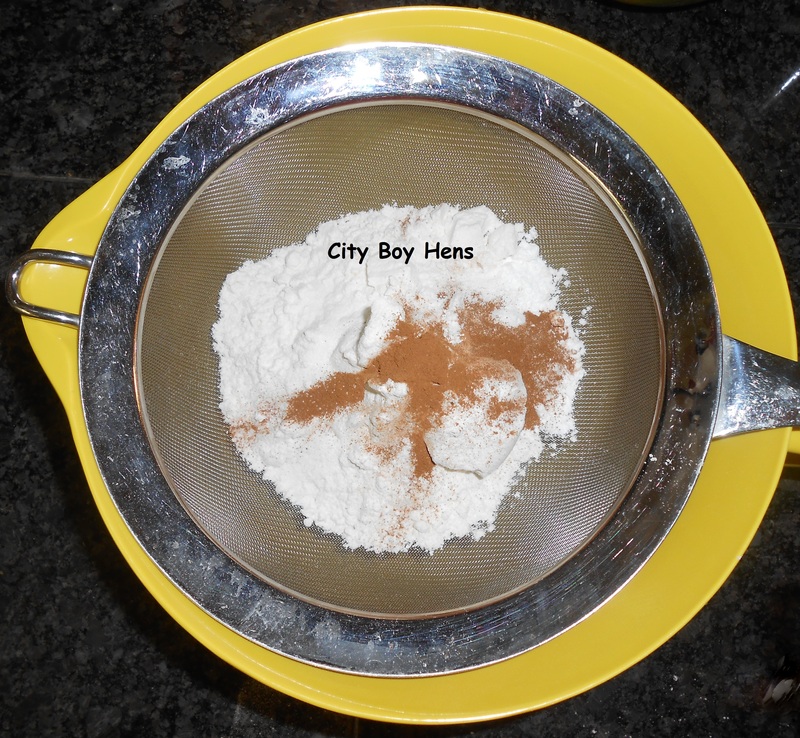 Sift together flour, baking powder, salt and cinnamon. Cream together butter and sugar in a separate bowl. 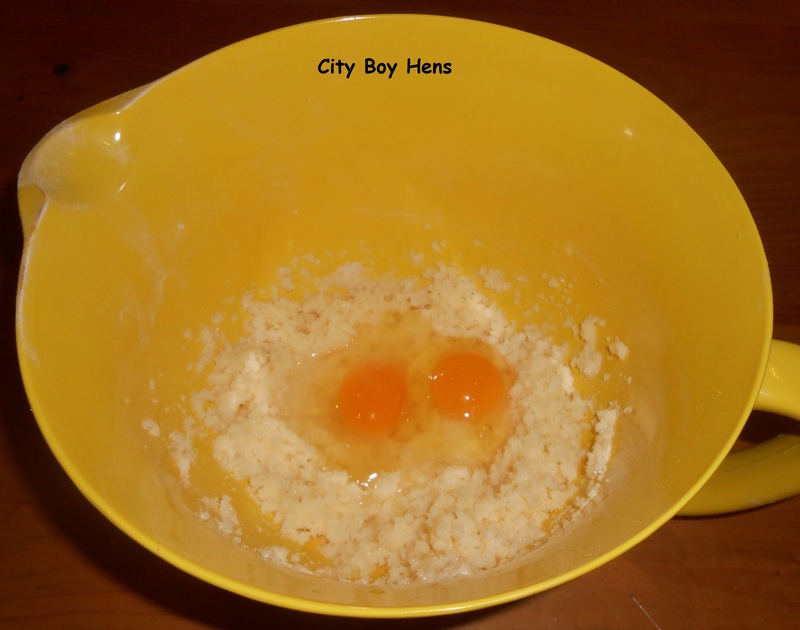 Beat in both eggs. Combine milk and vanilla extract in a measuring cup. Alternate adding 1/3 of the dry ingredients and 1/3 of the milk to the creamed butter. Beat in between additions. Once the final “thirds” have been added, beat the batter for 1 more minute. 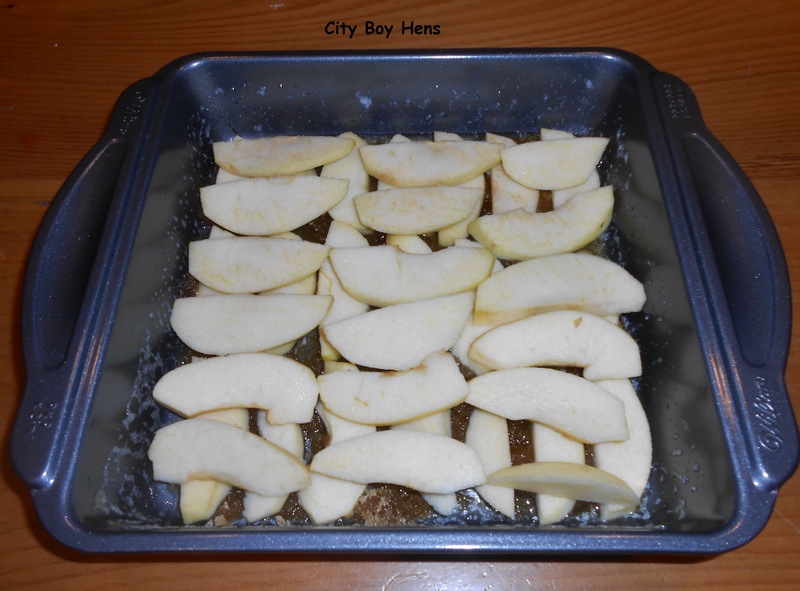 Spread batter over apples in cake pan. Bake for 45-50 minutes until golden brown. 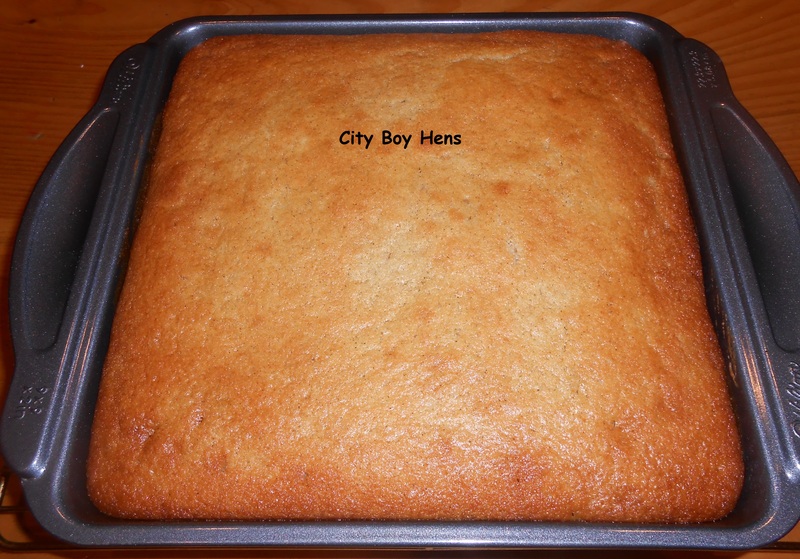 Cake is done when a toothpick is inserted into the center of the cake and comes out clean. Leave cake in pan and cool on rack for 30 minutes. 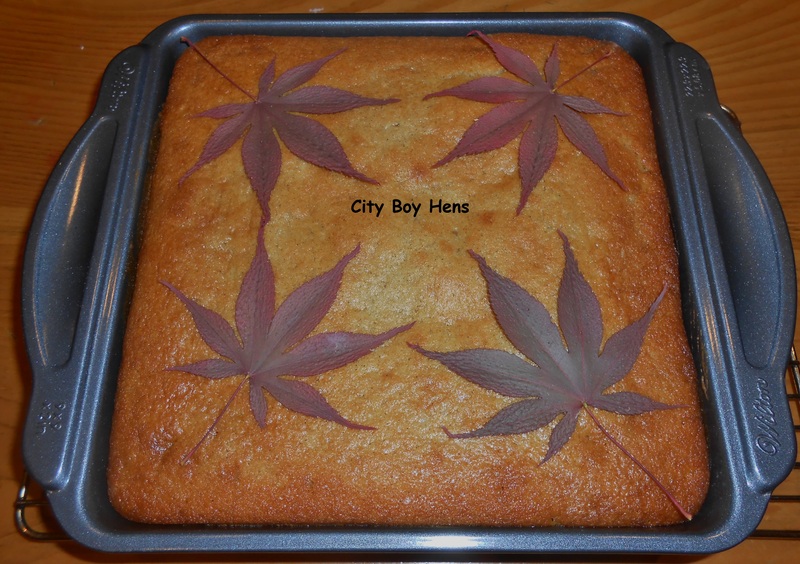 Now, decorate your cake with some leaves from your favorite tree. I used 4 Japanese Maple leaves that I managed to keep before they all blew off the tree. Contrary to dutiful son’s misunderstanding, they are not marijuana leaves. 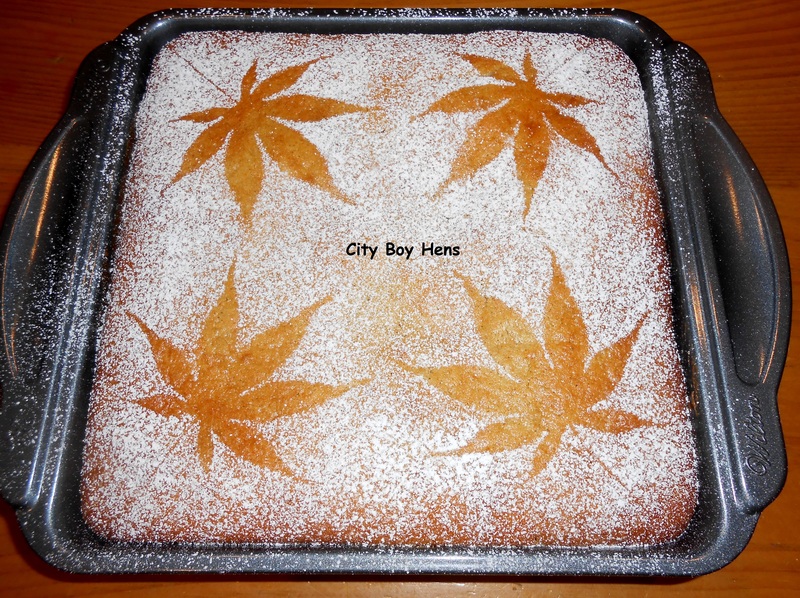 Sprinkle generously with icing sugar and remove the leaves. To all of my American family and friends, I wish you a great Thanksgiving weekend! I’ve been thinking of ways to use up my bushel of apples and I will definitely try this recipe. The leaves DO look similar don’t they? I’m gonna’ plead The 5th! Hope you try the cake. You two (above) are so funny. I always thought they did, but in all honest, I’ve never gotten close enough to tell the difference. I have learned I’ve lived a very sheltered life – not on purpose, it just was – and it’s just fine with me. I just pinned your post. I can’t wait to try this. It looks fab. thanks for the recipe it looks great and I’m definitely going to try it out. Thanks for stopping by. I hope you enjoy the cake. Hi, CB! I have had my Grandmother’s fresh apple cake on my mind, so this lovely creation fit right in with what I have been thinking about! I love the entire layer of apples- it makes it almost a cake cobbler. (I think you just invented a new dessert! “Cake Cobbler” shops will be opening all over!). I got a big kick out of your son’s observation on the cake decoration, but it is beautiful, and would look so nice on a Thanksgiving buffet. Thanks for your comments. I hope the cake makes it to your Thanksgiving table. Ha ha! I love that your son thought that your leaves were marijuana leaves! But seriously, I love this post and will be featuring it as my favorite at next week’s From the Farm blog hop on November 29th. I may even make this for our Thanksgiving table! Saw you featured on another blog . Lovely post and boy does that Apple cake look and sound delish ! Hello from a fellow Canadian in south western Ontario . I was raised on a farm living off of our livestock and land and I hear and understand what you mean in your about page of keeping it simple ! We live in an old farm house in a wide spread valley village with a river and forest and just love it here ! No farm animals but are working towards our own hobbie farm one day . I am a country gal it is in my blood .Thanks for sharing . Have a good weekend ! Nice to get a “local” comment. Consider getting a few chickens. You’ll have a blast. Hope you’ll drop by again. The cake looks really good and I love how you decorated the top of the cake – very lovely. Stopping by from Tuesdays with a Twist. I have apples on the brain, but man oh man that looks so good. There is really nothing that isn’t good with apples. Your son cracks me up about the leaves…lol. It never dawned on me until you said that. I just thought it was so pretty and a lovely way to dress up the cake. This is a must try for me!!! Thanks for your comments and the “feature”. I hope you will try the cake.